Yes, you did see the word salt in the title. These cupcakes are one of Martha Stewart’s recipes, from Cupcakes. I like Martha…I tend not to care about the whole insider trading thing…the woman can bake, cook, create an entire line of ‘good things’ out of stuff you find in your trash can. Anyways, back to the recipe. I made a few changes, and the frosting is completely off the cuff, but I think you will find these cupcakes delightfully tasty and unique. 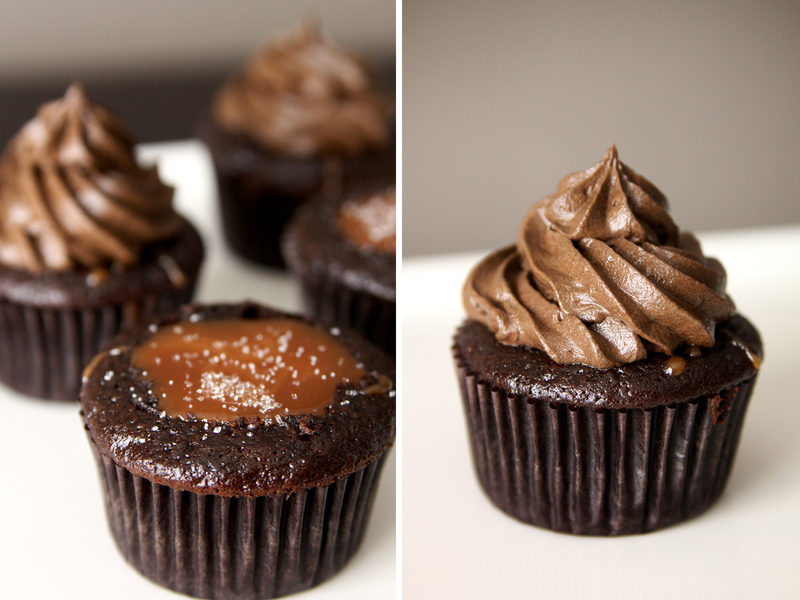 Adding sea salt to the caramel allows the caramel’s buttery taste and sweetness to really pop. Hope you enjoy. In a mixing bowl whisk together flour, cocoa, sugar, baking soda, baking powder, and salt. Add eggs, buttermilk, oil, vanilla and water. Beat on low speed until smooth and combined. Divide batter evenly among lined cups, filling each about two-thirds full. Bake about 15 minutes or until center is set. Cool completely. Heat sugar with water and corn syrup in a heavy saucepan over high, stirring occasionally, until syrup is clear; clip a candy thermometer to side of pan. Cook until syrup comes to a boil. Boil gently swirling pan occasionally, until mixture is caramelized and just reaches 360 F. Remove from heat and slowly pour in cream. Stir with wooden spoon until smooth. Stir in sea salt. Using a paring knife cut a cone shaped piece out of the center of each cupcake. Spoon 1 tablespoon of warm caramel into each cupcake center. Sprinkle with a pinch of sea salt. Using an electric mixer on medium-high speed, beat butter, confectioners sugar and salt until fluffy. Reduce speed to low, add cocoa, water and cooled melted chocolate, stirring until smooth. Pipe frosting onto cupcakes. Garnish with a pinch of sea salt if desired. The frosting on these cupcakes is optional, the caramel and cake can stand alone…but the frosting just makes them all the sweeter. This entry was posted in Cupcakes, Sweets. Bookmark the permalink. Yummy. Will make these soon! I am a huge fan of sweet and salty. Mainly the salty part. 🙂 Sounds yummy!